It has been a while since I made an entry for Letters That I'll Never Send. Nahihiya na tuloy ako kay Mys who hosts this one-of-a-kind meme. And because this week's theme is anything goes, and it has been a while since I blogged about my little Sam, let my letter be about her. 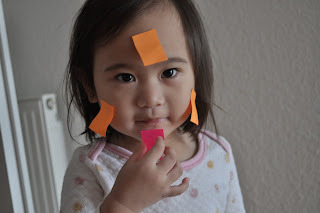 You, playing with my Post Z-Note Markers. You still find it difficult to communicate with us using concrete words but you are getting there. Your cute pronunciations of some words are just music to my ears. I love to hear you say apple, milk, book, eat, mimi, and oso over and over again.. You say them with much gusto and pouting of the lips. I look forward to hearing you sing to Mommy and Daddy. That will really be something to treasure forever. I could go on and on Sam but I guess I'll have to click Publish Post now. This letter is getting long and it would take forever for Tita Mys to read it. So I'm ending it here lest Mommy will go into the dramatic side of things. I do hope that when you are able to read, you will find this letter... and know that you are always treasured... you are always LOVED. our children are indeed the most precious human beings in our lives, sometimes we wished they would have not grown so we could always be with them, selfish wish but it is true. No amount of comfort and happiness these kids could possibly have done to us parents. I won't scold naman, even if it's long. I'm lucky to have you join this week. Yes, it's Dear Prom Date next week. My kids love Oso too. He's just too adorable for them. thanks for sharing your letter... i have always been planning to join this meme but never got the chance to write a letter yet.. So sweet naman ng letter mo. It's very sentimental. I'm sure Sam will be very much happy and would love to read all your letters to her when she gets older.